It says "Please remove this label". By feeling and pressing the sticker I do not detect anything underneath it. Holding to the light reveals nothing. The pages behind this page are all blank. There is no explanation in the guidance brochure they sent along with the passport (I am one of those people that reads every word of the guidance). 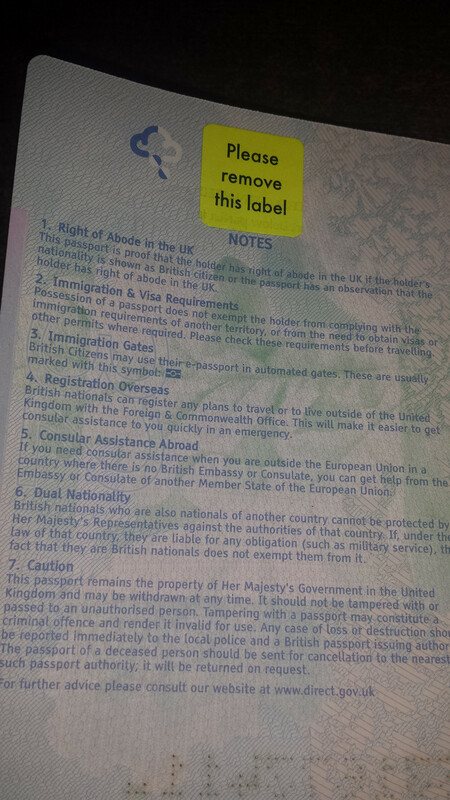 Below the sticker there is some text, if you read paragraph 7 you learn that tampering with a British passport may be actionable as a criminal offence. Incredible to relate, this text is on the same page as the sticker they want you to remove. Is the purpose of this sticker simply to prove I have examined the passport? Does it replace the wet signature the end user should provide? Or does it flag up if I walk near a scanner? Some kind of electronic signal? If not, what is the purpose of this sticker? I will be renewing my American passport later this year. Will it have the same thing? Something that needs to be removed where there's no apparent underlying purpose? What are the Americans doing? I do not know the answer and for reasons not worth exposing here I am reluctant to remove it. Yes, I know I can raise paperwork to the Passport Office for an explanation, but it takes a long time and a medium probability of having to approach the Commissioner to get it resolved. And when their answer finally arrived, there's a very good chance I wouldn't believe it anyway. 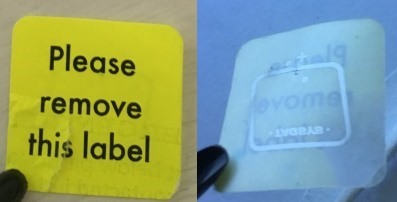 Question: what is the purpose of the "Please remove this label" sticker. There is an existing thread on the net and Nate Eldredge (to whom thanks) provided the link. Some ideas were floated but the thread degenerated into silly conjectures. They didn't nail it down. If it is some sort of progress indicator, why is it not on the cover? A blog entry discovered by cicto (to whom thanks) presents a credible discussion that the sticker contains an electronic circuit. But when it gets to purpose, the article descends into speculation. The general consensus on the internet seems to be that the sticker is an RFID chip used by Identity and Passport Service (IPS) to track the production process of the passport from start to shipping. There are many such questions disseminated across the web (here, here and here are a few examples). Most mention stories of people traveling with and without the label on their passport and none seem to have had any problem. Since you are effectively concerned about tampering with the passport, personally I don't think that removing a label which explicitly asks you to do so constitutes tampering. Tampering would be attempting to modify, forge, hide or remove any of the information recorded on the document. 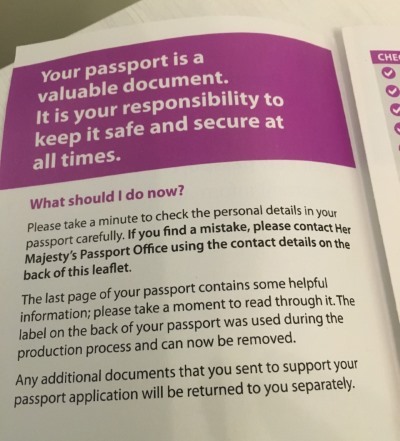 HMPO have now included a little note along with the passport that says "the label on the back of your passport was used during the production process and can now be removed". As for it being a method for "forcing" people to fall foul of tampering laws, I have a big roll of aluminium foil available for anyone who's worried about it. Of course, that foil is also useful for blocking RFID, so why not wrap your passport in it. The new passport contain an RFID chip in the back cover of the passport, I suspect the yellow sticker is actually to disable the embedded RFID chip, to stop it from being read while the passport is being delivered. The position of the yellow stick on the page before the back cover seems to correspond with the position of the RFID in the back cover. Not the answer you're looking for? Browse other questions tagged uk passports legal uk-citizens or ask your own question.